Use the "Add Calendar -> Add Google Calendar" command on the File menu. Right-click in the Calendar List and select the "Add Calendar -> Add Google Calendar" command from the popup menu. The Add Google Calendar command is accessed from the File menu. Before using the "Add Google Calendar" command for the first time, make sure you're logged into the desired Google account in your web browser. A list of available Google calendars will be displayed in the Add Google Calendar Window. You can pick a calendar from this list that you'd like to sync with VueMinder. After selecting a calendar, click the "Add Calendar" button to add it to your Calendar List in VueMinder. Note: The Add Google Calendar window is used to add existing Google calendars to VueMinder. 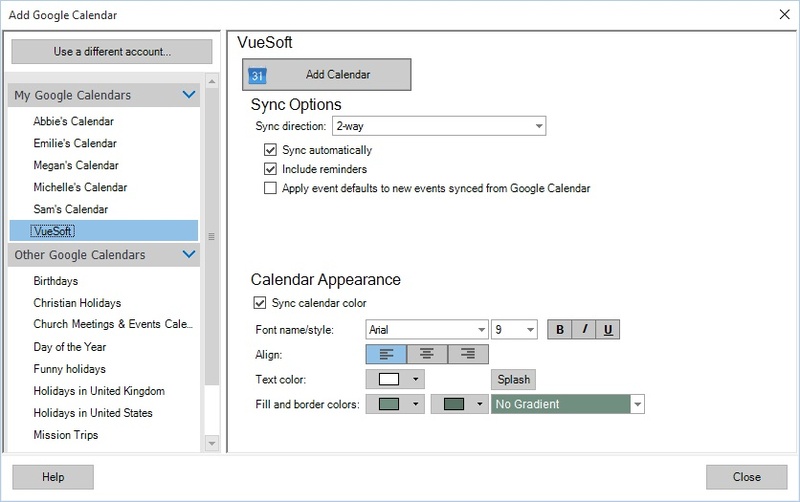 If you have a calendar in VueMinder that you'd like to add to Google Calendar, syncing can be enabled on the Sync tab of the Calendar Properties window. To add a Google Calendar, click the "Add Calendar -> Add Google Calendar" command on the File menu. If you're not already logged into a Google account, a secure web page will prompt for login. After logging into Google, another page will appear requesting permission to access your Google calendars, contacts, and tasks. After granting permission, the "Add Google Calendar" window will appear. Two categories of calendars will be displayed, labeled "My Google Calendars" and "Other Google Calendars". These will typically correspond to the "My Calendars" and "Other Calendars" items shown on the Google Calendar webpage. Calendars that are both readable and writable will be listed under "My Google Calendars", while calendars that are read-only will be listed under "Other Google Calendars". The mapping might not always be one-to-one with what is seen on the Google Calendar web page, since you may have read/write access to calendars that belong to other Google Calendar accounts. Calendars listed under "My Google Calendars" can sync with VueMinder either 1-way or 2-way, while calendars listed under "Other Google Calendars" will only sync 1-way from Google Calendar to VueMinder, due to the calendar being read-only in Google Calendar. VueMinder can only sync with one Google account. If the Add Google Calendar window doesn’t list the calendars associated with your other account(s), open the Google Calendar webpage and log into your other account (the one that isn’t synced with VueMinder). Click the drop-down arrow next to your calendar’s name and select "Share this calendar". Enter the Google account name that you use when syncing with VueMinder. Make sure to adjust the calendar permissions as needed. In VueMinder, click the "Add Google Calendar" command on the File menu. You should see your other account's calendar in the list. You can add the calendar and VueMinder will sync with the calendar just like the calendars in your primary account. 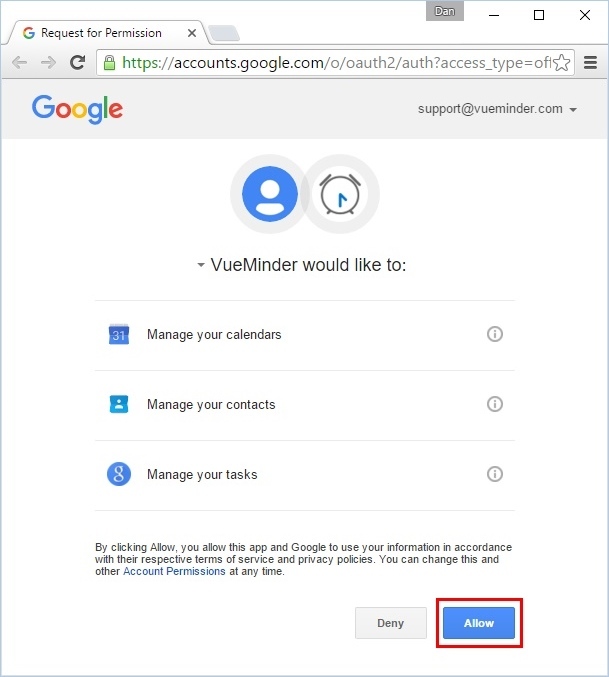 If you want to switch VueMinder to sync with a different account, click the "Use a different account" button in the upper-left corner of the Add Google Calendar window. Note, any calendars that were previously synced with Google Calendar will no longer sync. If you need to sync with multiple accounts, see the instructions above. After clicking the "Use a different account" button, a message will appear with additional instructions. Follow those instructions to configure VueMinder to sync with a different account. 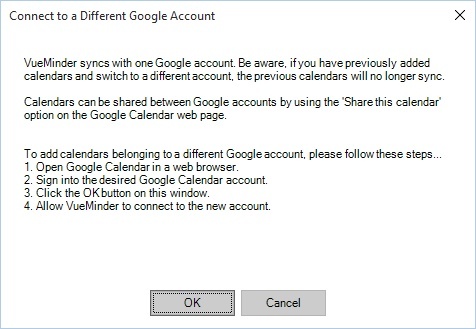 After following these steps, the Add Google Calendar window will refresh to show the calendars associated with the account that is signed in. To add a Google Calendar to your calendar list in VueMinder, select the calendar from the list on the left, and then click the "Add Calendar" button. You can also adjust the Sync Options, as described below. Sync direction - For Google Calendars that you can modify, two options will be provided for the sync direction: 1-way Google Calendar To VueMinder or 2-way. Choose whichever option will best match the way you intend to modify your calendar. 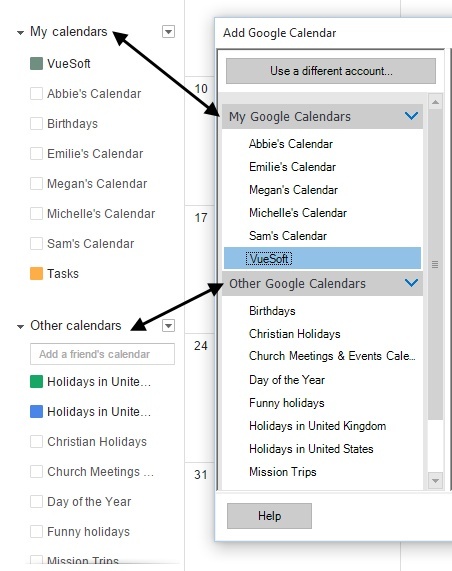 If you need to modify the calendar from both VueMinder and Google Calendar, the 2-way setting would be the best choice. The 2-way option also enabled syncing VueMinder with mobile devices through Google Calendar. Sync automatically - This checkbox enables selection of whether calendars will sync automatically whenever changes are detected, or only when commanded by the user. Automatic syncing will happen within 30 seconds of any changes. Syncing can be manually commanded by right-clicking the calendar name in the Calendar List and selecting the "Sync Calendar" command (or by pressing Ctrl+F5). A "Sync Now" button is also available on the status bar and will be shown when the calendar is activated in the calendar list. Include reminders - When checked, reminder settings will sync between VueMinder and Google Calendar. For example, if an event is created on Google Calendar with a popup reminder to appear 10 minutes before the event starts, VueMinder will also show a reminder 10 minutes before the event. Note, this only is applicable to popup reminders, not email reminders. Apply event defaults... - This setting will cause any new events added remotely in Google Calendar to automatically have default settings applied when added to VueMinder during a sync. These defaults are specified in the Event Defaults tab of the Calendar Properties, and can include default reminder settings, categories, and more. The Calendar Appearance settings will default to a much closer match of the Google Calendar event colors. With a gradient style of "No gradient" selected, the second background color is used as a border color, similar to how all-day events are colors in Google Calendar. When colors are assigned to individual events in Google Calendar, those color overrides will sync to VueMinder. Overall calendar colors are also synced. If the calendar appearance is changed in VueMinder, the color in Google Calendar will be set to the closest match. Here's an example of events on the Google Calendar webpage. One event uses the default calendar color and the other event uses a color override. Here's how the events appear in VueMinder.